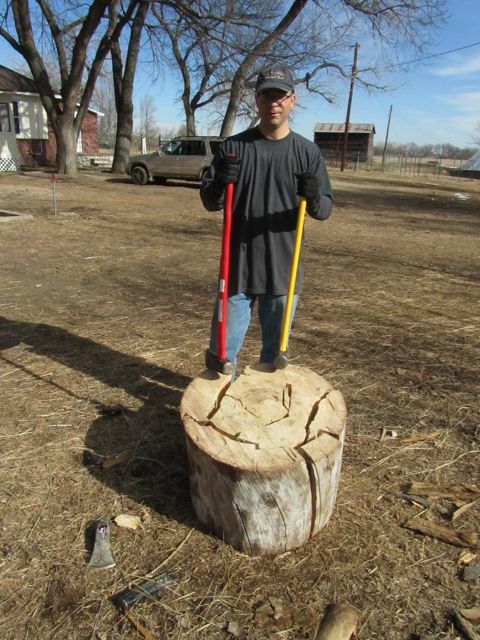 Larry: We still needed to cut up the trunk of the huge tree that was 39" in diameter, and had 95 rings in it, so Todd and I decided to look for a large two-man hand saw since Mary wouldn't let me buy a BIGGER chain saw! After inquiring, we were directed to an auction/antique shop where we found a six-foot log saw with no handles, but plenty of rust. We figured if it didn't do the job, we could display it somewhere. Getting the saw sharpened and in working shape proved to be quite an ordeal. After many phone calls, I found someone who knew where to get it sharpened for $5 a foot. He packed it and sent it out for us, and we received it back in a few weeks, nicely sharped, oiled, and the rust ground off. 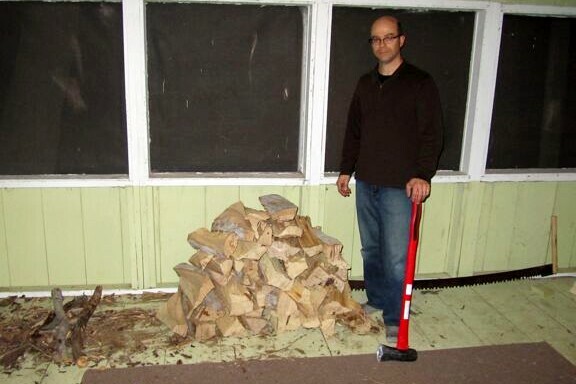 Then, Todd and I took the broken handle from an eight pound sledgehammer and fashioned two hardwood handles. We were in business. Next, to learn the special technique involved. With a saw like this, you only pull, contrary to your instincts, or you end up with a bent saw. It takes some getting accustomed to, and it is a LOT of work. After I left, Todd discovered he could do it by himself. The trunk has 95 rings. Now we know the tree's age, plus all the years it stood there dead. 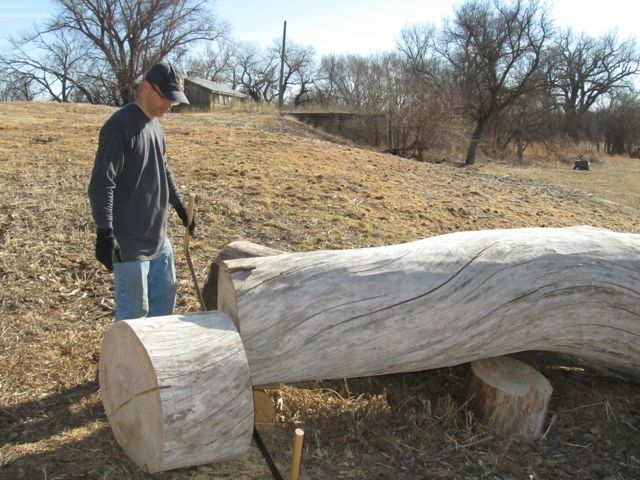 Todd: Cutting through the second half of the log was lots easier, and with my new tools, my log splitting skills are approaching super-power status! Todd: Here's a picture of the firewood I got out of that slice. It's two full wheel- barrows, enough for two normal winter days. 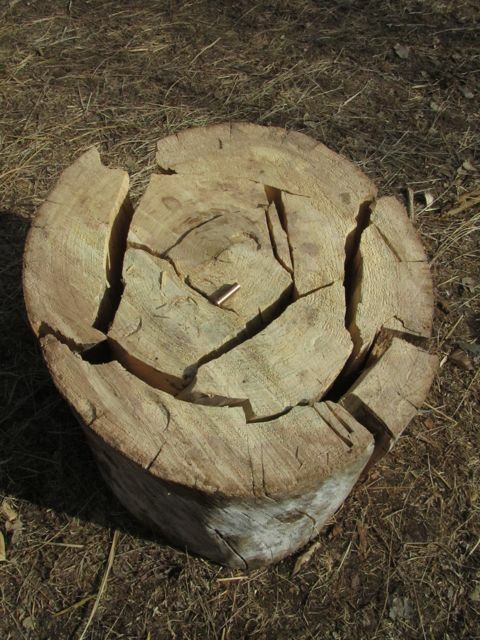 The slice I cut is from the biggest of two branches and it has a cross section of about 500 square inches and contains seven slices (14 days). There's another branch that's 400 square inches and contains five slices (8 days). And then there's the trunk that has a cross section of 1000 square inches and contains five slices (20 days). That's six weeks worth of warm house! 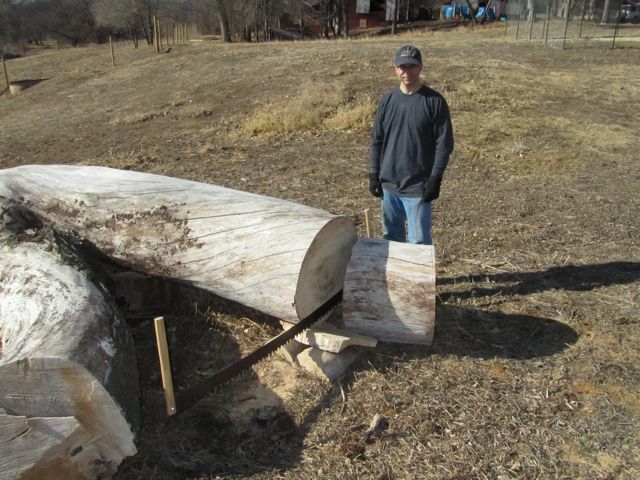 That's not counting all the wood we previously cut from that large tree.